Newly renovated apartment(2016) with a magnificent sea view in a city center of Aghios Nikolaos. Close to beaches, restaurants, cafe bars, harbour and lake area. New air condition, kitchen, flat TV, washing machine and washing dishes machine.The location is in a quite living area with magnificent sea view to Mirabello Bay. Food, drinks, facilities, night life and amusement, shopping, sightseeing, banks and beach at no less than 100 meters. You combine the beauty of the island with all possible facilities within reach. Parking space in the street if you rent a car for your excursions. If you want to have a beach holiday you do not even need a car on this location! I am 48 and I am Food Engineer fall in love in Creta island. I fall in love of this apartment because of fantastic and picturesque sea view. Apartment has nice east orientation which makes it ideal for enjoying! 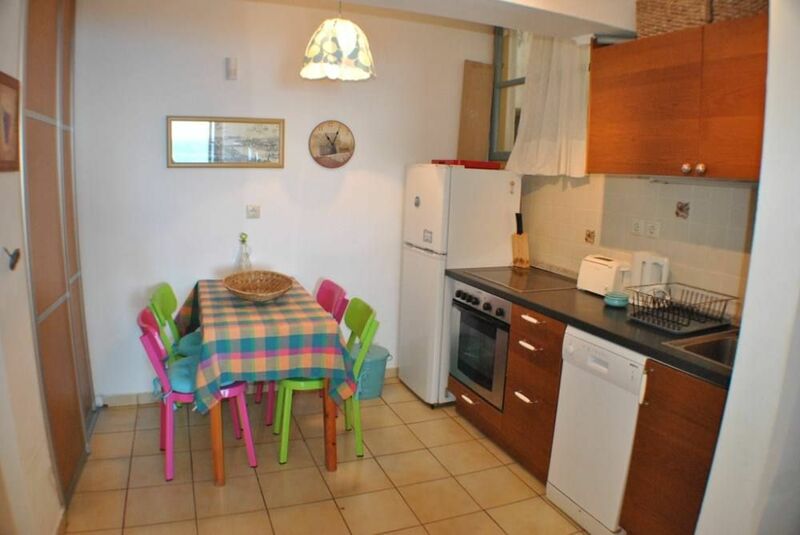 Fully equipped kitchen where you can make almost everything and serve at balcony while monitoring Mirabello Bay. Dear Guests, I bought this apartment because of unique position and fantastic view to Mirabello bay. As a Food Engenieer I tried to make kitchen well equipped for making almost any dish. Creta is symbol of great olive oil, goat and sheep cheese, fruits, vegetables, meat and fish which you can buy either in the supermarkets or every Wednesday on green market which is located close to Hospital area 200 meters away. Enjoy your stay with local taste and beautifully clean sea! The apartment was clean, tidy, it had all we needed for a fabulous holiday. We can recomend this apartment as a fantastic option for summer holiday close to beach and supermarkets close to city centar. Quite and pescfull area no loud music but close to city center. Lovely bAlkony with magnificent era view! Fully equiped kitchen, we made fantastic dinners enjoyibg beatiful view from balkony to Mirsbello bry! Outstanding view. The perfect location in a great vacation town. Clean and well equipped & managed. Thank you very much four your feedback about your stay. We are glad that you enjoyed your stay! Hope to see you next time in the future! Best Location in Agios Nikolas!!! We were fortunate to stay at this lovely condo for almost 2 months. The location is perfect with it's sea views, a 10 minute walk to the lake and the city center and a 2 minute walk to the street market. The location is wonderful because as you get closer to the city center, the noisier it gets. This is perfect with a quiet area, lovely views and well equipped condo. The condo had everything you need. Boris even added English speaking channels to the TV before we arrived. He is a pleasure to work with. Sasha, the property manager is also wonderful. Search no further, stay here and you will have a wonderful time!!! Thank you very much for your feedback! I am in love with Agios Nikolaos and magnificant seaview from my balcony. I hope I will be your guest too!! Die Wohnung ist zwar etwas eng und könnte sauberer sein, ist aber sehr zentral und doch ruhig gelegen. Zwei Personen können auf dem Balkon problemlos essen und die prächtige Aussicht geniessen. Ende Oktober hat die Wohnung nur Morgensonne. "I stayed at this apt for 4 glorious weeks. Very convenient to the beach and local shops. It is in a very quiet area and the apt has everything you could possibly need, even a dishwasher!! The apartment was very clean and easy to maintain with a view to die for. I shall definitely be back"
From Heraklion airport (HER) follow sign Agios Nikolaos. When you arrive to Agios go strait ahead and follow bulevard which leads to roundabout where is hospital location. On the roundabout, take third exit following downhill street direction police station. You arrived to Erithorou Stavrou street. Go right till the number 24. Apartment is close to the harbour. Visit Elounda and Spinalonga island. Knossos archeology. Lasithi Plateau. Boat trips, scuba, water sports,beaches nearby, golf site 2 km, excellent restaurants and cafe bars in cosmopolitan resort. Children under 2 years are free of charge.